A super-speedy phone that does a top-notch job all round. A real smartphone however you look at it. Even using all the features on offer from the Samsung Galaxy II, we managed to get a full day out of a battery charge. With average use you should be able to get away with charging every other day. Unlike fine wines, mobile handsets don’t tend to get better with age – it’s amazing how quickly a phone that was leading edge can quickly become a bit of a has-been. While this may not have been the case with the original Samsung Galaxy S, we were nonetheless quite pleased to hear that a sequel was announced at the Mobile World Congress in February. Well, we've been very patient and waited three months to get our paws on the phone that Samsung has dubbed the best-ever smartphone. Looks-wise, we always said the first Galaxy S was pretty similar to the iPhone 3GS, which while hardly a bad thing, meant that it was not exactly pioneering. Sure, any touch-display candybar handset is going to look similar – especially if it’s in silver and black – but we’re happy to announce that the Galaxy S II breaks the mould when it comes to design. With its 4.3in display it’s far bigger than its older brother – and that display is a Super AMOLED Plus. When it comes to colours and pixels, it’s pretty similar to the original Galaxy S, but thanks to the dual-core chip and high contrast ratio, it is superior in terms of both sharpness of definition between colours and vibrancy. We can’t say that it’s in the same league as the Retina Display on the iPhone 4, which is a class-beater at the moment, but it’s not far behind. 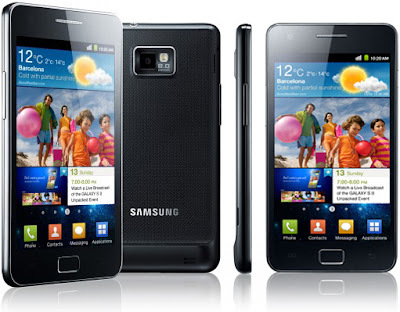 To fit in the screen, Samsung has made the Galaxy S II quite a lengthy beast, although it remains one of the slimmest handsets currently available – at just 8.49mm thick. There are far sharper edges on this phone, and along with its correlated back this results in a pretty darn good-looking handset. One thing we must say about the back cover is that it seems less than sturdy when you’re taking it off to take out the battery – which unfortunately you have to do if you want to hot swap memory cards – and can be pretty tough to clip back in too. There’s also a slight ‘chin’ on the base of the phone – but it doesn't detract from its good looks. We found the touch-display enormously responsive, offering a really smooth user experience. While the phone runs on the latest Android operating system – Gingerbread 2.3 – Samsung has given it its own personality by adding the TouchWiz 4.0 skin. It has not always been well received by phone buyers, but happily this is an updated version, which works better. The icons have a touch of the 3D about them and you’ll find the Live Panels appear on any of the seven home screens – there’s also a real-time weather widget, rather like that which appears on the Android handsets produced by HTC. The graphics can’t compete with those on the handsets produced by the Taiwanese manufacturer (they’re not animated for a start), but the ability to add 10 different cities is a nice addition. It’s also possible to add a number of shortcuts and widgets to the home screens by dragging and dropping from the main menu – or you can hold your finger on the display to make the menu option pop up. A virtual panel or grid system means that you can’t just drag the icon exactly where you want it, but it doesn’t have any major implications for your operating experience. What is strange is that two of the four ‘set’ icons that stay at the base of each home screen also do the same thing. The Phone and Contacts icons both take you to your contacts, groups, favourites and logs. It just seems odd that this space isn’t used for something more useful – the camera for instance. To see all of the home screens as thumbnails, pinch and pull on any home screen – it’s speedier than scrolling through each one individually. When it comes to messaging, you can use the SWYPE method or the more traditional QWERTY keyboard. The SWYPE method can make typing a quick experience, but as on other Samsung handsets, the full stop key and space bar are so close that it can make it a tad tricky. If you haven’t encountered SWYPE before, it works by sliding a finger from key to key and lifting your finger off when you finish a word. It may sound a bit odd but it actually works really well. If you’re texting, you can hold the handset horizontally and the display will auto-rotate, showing your messages on the left of the screen and the last message with your chosen contact and your own text entry box on the right. Another new feature on the Galaxy S II is gesture control. This uses the handset’s accelerometers – hold two fingers on the display while you’re browsing, then bring the phone towards you to zoom in, and tilt it away to zoom out. And when you’re dragging and dropping widgets, select the home screen and panel you want by moving the handset from side to side. By the way, we found browsing hugely speedy, even when we had a number of web pages open. This is thanks partly to the speed of Wi-Fi and HSDPA connections, but mostly thanks to the dual-core 1.2GHz chip. We were able to stream videos from YouTube almost instantly, and there was hardly any buffering necessary. Gaming was a smooth experience, offering incredibly crisp graphics. Uploading contents to sites such as Facebook, You Tube and Flickr was massively quick thanks to the HSDPA connection speeds of up to 5.76Mbps. It’s possible to download games from the Games Hub. There’s not much to choose from at present, but we expect that will soon grow – and you can try before you buy any of the games currently on offer. There are also hubs for Music, Social and Reader. We were particularly keen on the Reader Hub, which appears as a virtual bookcase, offering access to any number of newspapers, magazines, and books from around the globe. Choose to subscribe to your favourites and they will be instantly downloaded once the next edition is released. You’ll need to do a bit of zooming when you’re reading, especially if you’re browsing newspapers, but it’s a great way to catch up with the latest news on a boring commute. Samsung has tried to compete with iTunes with its Music Hub, but it doesn’t manage to match it in terms of either usability or content, although tracks are offered at a reasonable price. It is possible to search for artists or titles or have a browse through recommended or genre sections. It is also possible to make your own playlists or albums from the music you buy. The Social Hub meanwhile, will integrate emails, text messages, social network feeds and Instant Messaging information into one feed. You can choose how often it is updated, but bear in mind data charges when you make that decision. Apart from a notable few, such as Sony Ericsson's recently launched Xperia Arc, the snappers on Android phones have always been something of an afterthought, never living up to the other features on the phone. There is no dedicated shutter key, which we find annoying, but we were pretty impressed with the shutter speed, along with its eight megapixels, auto-focus and face and smile detection. We’re glad to see LED flash included, as it was a notable omission on the original Galaxy, which made it impossible to take night-time shots. One downside is that the handset is so long that when we held it horizontally to take a snap, we found our finger kept covering up the lens, and while the pictures weren’t as colourful when we put them on Facebook, video came out far better. Overall, we think the snapper is worthy of praise, and while it doesn’t beat the camera on the Sony Ericsson Xperia Arc, it’s certainly ahead of the rest of the Android pack in terms of camera cred. Another outstanding feature it its sat nav. The A-GPS fix was one of the speediest we’ve seen so far –when we tried to fool it by using it indoors it still managed to find our exact location. Along with Google Maps, you also get the use of Google Maps Navigation. Our review handset only featured a beta version, but we were still able to enjoy clear, full voice instructions for driving and walking – you have the option of layering a traffic or satellite view over a 3D map. We can’t speak highly enough about the Samsung Galaxy S II. If we had to describe it in just one word, we’d choose ‘brilliant’. While we have pointed out a couple of shortcomings, there is nothing that would dissuade us from buying this phone for ourselves. Samsung has shown it is really making headway in the world of smartphones and has made a huge amount of progress with the Samsung Galaxy S II.